Born in Tokyo in 1976. Kawasaki released a number of works on cassette tape in 1994 and '95. In '96, he released the solo album Static Pulse on Zero Gravity. 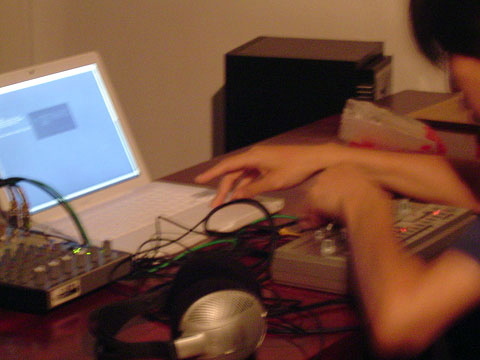 Kawasaki has gained attention for his improvisational performances using a vintage analog synthesizer. Mongoose, the trio made up of Kawasaki, Taku Sugimoto and Tetuzi Akiyama, carried out a European tour in October 2000. In 2002 Astro Twin / Cosmos, a split CD by Astro Twin (Kawasaki's duo unit with Ami Yoshida) and Cosmos (the duo of Sachiko M and Ami Yoshida) won the Gold Prize in the Digital Music Division of Ars Electronica. Amorphous Spores, Kawasaki's album with Takahiro Kawaguchi, was released on the U.S. label Erstwhile Records in October 2015. He has made numerous CDs together with various artists inside and outside Japan.